The six month mark after Haiti’s Jan. 12 earthquake saw a flurry of news reports in Canada and around the world. The depictions of the harsh conditions still prevailing for most earthquake victims took many people by surprise. The relative silence of the media over the last few months led many to assume that the international aid effort had accomplished much more than it has. 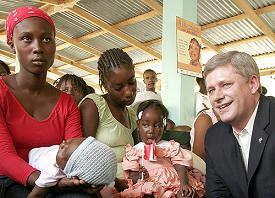 On the eve of July 12, contradictory or exaggerated claims were made about Canadian government aid to Haiti. The Canadian Broadcasting Corporation and Canwest news agency reported that Canada has committed “more than $1 billion” for Haiti. Yet only days earlier, on July 9, the Quebec French-language daily Le Devoir, and the English-language Canadian Press news agency, reported that Canada has not given a dime to the Haiti Reconstruction Fund established by the March 31 United Nations Donor Conference in New York. So what is the true record of Canada’s assistance to Haiti since the earthquake, and what more needs to be done to assist the hundreds of thousands of victims who have received little or no aid? In a July 9 press release, written as a rebuttal to the aforementioned Le Devoir and Canadian Press reports, Foreign Affairs Minister Lawrence Cannon and Minister of International Cooperation and Development Bev Oda stated that Canada had contributed $150 million to Haiti in the weeks following the quake. The ministers also said an additional $400 million has been pledged to Haiti for the next two years. At a subsequent July 12 press conference, the ministers upped the figure, saying that Canada has spent, or is committing, a total of $1.1 billion in aid to Haiti. But their time frame of commitment predates the earthquake considerably, covering the years 2006 to 2012. Other figures are also misleading. The $150 million figure noted on Jul. 9 reflected spending announcements in January and April. The $400 million figure was announced by Canada at the March 31 UN Donors Conference. Media reports gave the impression that this $400 million is Canada’s contribution to the Haiti Reconstruction Fund (HRF) established at the conference. In fact, Canada’s contribution to the Fund is listed on the Fund’s website as “$30-$45 million” [funds listed are in US dollars]. It so happens that $30 million is the minimum payment required to secure a seat on Fund’s board of directors. The HRF’s spending decisions are controlled by international financial institutions, the Fund’s board of directors, and the Interim Haiti Reconstruction Commission. The latter consists of 26 members, half of whom are non-Haitian. It is chaired by former U.S. president Bill Clinton and Haitian Prime Minister Max Bellerive. Few of the countries pledging to the Fund are in a rush to pay up. According to the undated pledge page on the Fund’s website, only three countries have met their pledges – Brazil, Australia and Estonia, for a total of US$64 million. Canada says it will pay up “soon.” But Cannon and Oda voiced a reason for their delay at the July 12 press conference. They said they are concerned by Bill Clinton’s remarks the preceding week in which he criticized laggard donor countries for their failure to pay. Cannon said: “I want to be able to, with Minister Oda, discuss with [Clinton] so that we scope all that out and get a better sense of what he means by those comments.” Canada’s government has been telling its people that its response to the earthquake was swift and generous. Clinton’s remarks were an embarrassment to it. The Fund’s total pledges amount to a paltry US$509 million. The $5.3 billion-plus figure which the international media reports as pledged consists of money promised to Haiti by the world’s governments and aid agencies at the March 31 conference, in all forms and covering the next 18 months. For Haiti, there is a major concern with the promises. The record following previous natural disasters is that the majority of funds promised are never paid. There is every reason to believe that this will again be the case unless significant political pressure demands aggressive and meaningful reconstruction aid from the world’s big powers. There is another flaw in the international financial promises: very little aid is going to Haitian organizations. Dr. Paul Farmer of the prestigious Partners In Health testified before the Congressional Black Caucus in Washington, DC on Jul. 27 that of the $1.8 billion in earthquake relief sent to Haiti to date, only 3% was delivered to the Haitian government. Even Canada’s outgoing Governor General, the Haitian-born Michaëlle Jean, was moved to say in France recently: “The time has come to break with the logic of aid that has transformed Haiti into a laboratory [for NGOs]” [Agence France Presse, Jul. 20]. * $555 million for 2006-11. * Status: Most of this money predates the earthquake. It largely has funded police and prison institutions as well as massively boycotted 2009 elections. * $400 million announced on March 31, 2010 and again on Jul. 12. * Status: Promised over the next two years. * $150 million for short-term earthquake relief. * Status: Given to UN agencies and NGO’s, difficult to confirm how much was spent, and where. * $30-45 million to the Haiti Reconstruction Fund. * Status: Yet to be paid. * Sums spent on Canadian military and police agencies in Haiti. * Status: Amounts unknown and unreported. Additionally, the Canadian federal government has said it will match $220 million of the donations that individual Canadians gave to charities between Jan. 12 and Feb. 16. The Canadian International Development Agency (CIDA) said in New York on Mar. 31 that half of the $220 million, that is, $110 million, is included in the $400 million announcement. The other half, Minister Oda said on July 12, would go to “the continuing work of humanitarian development [non-governmental organizations] and institutions in their efforts.” In other words, it is not new money at all. Several expenditures recently announced by Canada for police training and equipment as well as prison construction were not mentioned by the ministers on July 12 and do not appear in earthquake relief announcements by the government or CIDA. These include $34.6 million announced by Minister Oda on Apr. 8, and $4.4 million by Minister Cannon during a three-day visit to Haiti in early May. Such spending on police and prisons is not the first for Canada since Jan. 12. The principal Canadian government response to the earthquake was to dispatch two Canadian warships loaded with nearly 2,000 soldiers and sailors. They arrived offshore from Léogâne and Jacmel on Jan. 19 and 20. At the time, this was touted by the government as a major earthquake relief operation. But as the March 12 Halifax Chronicle Herald later reported, the ships carried relatively few earthquake relief supplies and equipment. They were instead loaded with military personnel and supplies. The military operations performed only peripheral aid and supply tasks. The medical teams the ships brought did not perform a single surgery, according to a study by John Kirk and Emily Kirk in April (www.counterpunch.org/kirk04012010.html). When the ships departed six weeks after arriving, they took with them their vital air traffic control and heavy lift equipment. The Canadian military operation was identical in motivation to the much better known U.S. military intervention. Both were intended to stifle any aspirations for political sovereignty and social justice that were dashed by the U.S./Canada/France-backed overthrow of Haiti’s elected government in Feb. 2004 and that might arise anew in the aftermath of the earthquake. Furthermore, Haiti was “used as a launchpad for redeploying [Canadian] combat troops to the Middle East war theater,” reported Global Research’s Michel Chossudovsky on Mar. 29. “Canadian troops initially dispatched to Haiti under a humanitarian mandate are being sent to Afghanistan,”as was done with US troops. Though the military convoy was announced as Canada’s principal emergency response to the earthquake, the expenditure for it is nowhere listed in CIDA or government summaries of earthquake aid. The Quebec-based Architectes de l’urgence (“Emergency Architects”) says it has been waiting three months for funds from the UN and European Union so they can begin to construct shelters. “We still haven’t seen a dime,” says its president, Patrick Coulombel. “Removing the rubble left behind by this disaster, reaching remote areas with building materials, and obtaining permissions to build from landowners remain our main challenges to providing sturdy shelter for families,” Conrad Sauvé, secretary general of the Canadian Red Cross, told the same CBC news report. Two of the most pressing needs in Haiti today are the clearing of rubble from the streets and neighbourhoods, and the construction of temporary or permanent shelter. According to UN agencies, 125,000 durable shelters are needed, but only 5,000 have been constructed. With all of the equipment and resources available in wealthy countries like Canada, such immediate needs should be well on the road to being met. Yet, they persist. It is a testimony to the failure of will and good intentions of the world’s wealthy governments. According to CBC News, observers say it could take 20 years to clear the rubble from the cities in the earthquake zone. The Haitian people, of course, will not wait that long. They are speaking out, protesting and taking reconstruction into their own hands wherever possible. All signs point to a deepening effort by the Haitian people to take their destiny back into their hands and launch the reconstruction effort that their foreign overseers are so demonstrably unable to lead.